Supersports flagship models designed for the Japanese market are gradually being introduced into export markets as premium products. Exported in limited numbers and sold at astronomical prices, these mechanical jewels are not intended for serious competition work, for their engine capacity doesn't fit conventional formulas. These are machines designed purely for pleasure. 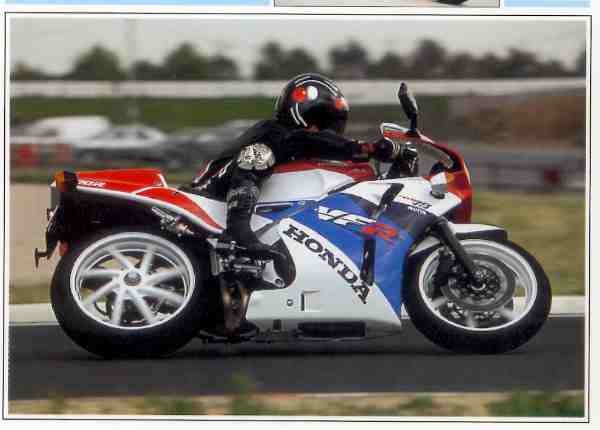 Honda caused a sensation in 1989 by unveiling its VFR750R (better known as the "RC30"), for it was a faithful replica of the World Champion endurance racers. For the home market, where engine sizes are restricted, Honda repeated the exercise in 1991 with this VFR400R (or "NC30"), the ultimate, highly sporting, descendant of the VF400F launched in 1982. While the engine capacity and configuration remained the same, everything else was changed. A masterpiece of compact design, the VFRR packed a lot into a little. As on the RC30, the V 4 engine was suspended from twin aluminum beams, single-arm rear suspension was used and the standard of finish was as high as the price. This little 400 has excellent performance, with a top speed of over 125 mph and matchless stability. But most of all it is the astonishing flexibility and impeccable handling that allow this bike to switch with ease from city traffic to race track. Even the passenger is not forgotten: a dual seat makes him as comfortable as possible. The V4 power unit of Honda 's VFR400R superbike is suspended from the aluminium double backbone frame.